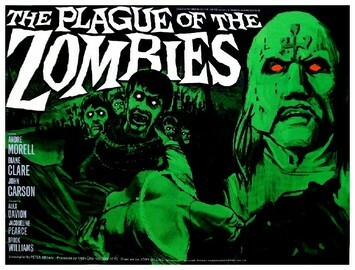 You probably remember the tagline from this movie’s poster: When there is no more room in hell, the dead will rise and work in an old abandoned tin mine in Cornwall. You can imagine the terror that strikes in the hearts of out of work miners everywhere. With increased automation, jobs going overseas, and lower wages and benefits, now there’s competition from dead people! And they don’t have to worry about black lung disease because they don’t even breathe! Just as scary though is that our hero is about a hundred years old! Don’t misunderstand me, André Morell is a comforting presence in any movie, but I’m not comforted when it’s up to my great grandpa to take on a bunch of zombies, even if they are just British ones. 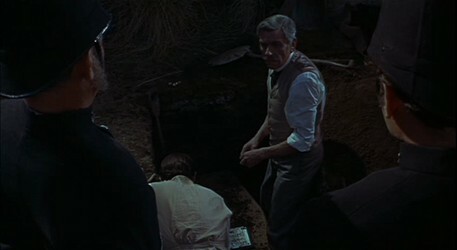 The role requires him to dig up and rebury graves at regular intervals. I kept waiting for the old coot to stroke out or drop over from a heart attack. That isn’t the type of concern you’re supposed to have for your hero’s safety in these sorts of pictures. Morell, who plays Sir James Forbes, eminent professor of medicine from London, also generates cheap suspense when he has to have a fight scene. How are we supposed to believe that this geezer is going to be able to control his bladder long enough to move out of the way of a dagger, let alone brawl with a guy, set him on fire, and stab him to death? I guess the filmmakers would have us chalk it up to all the special forces training he received in medical school. So what the devil is a hoity-toity centenarian tough guy like Sir James doing in Cornwall hanging out in some hick village that’s gone and gotten themselves a bad case of the zombies? It all begins with a mysterious letter from one of his former students. Sir James would later claim that the guy was his cleverest student, but I think he was just trying to pump the guy up a little since he let his entire village get taken over by a voodoo cult of all things. Dr. Peter’s letter complains that a strange malady has overtaken many members of his village. It’s characterized by a loss of appetite, paleness of skin, and sudden death. Also, that old abandoned tin mine just outside of town is finally going to reopen again. It’s probably a foreign company using their own workers though because they’re grey, lumber around and are a bit musty smelling. Sir James isn’t too keen on having anything to do with any business up in Cornwall but he has his great granddaughter Sylvia living with him. Dr. Peter is married to Sylvia’s friend Alice and Sylvia thinks it would be a good chance to go and visit her. At the village, Dr. Peter is facing a crisis of confidence with the villagers since they want to know what is causing all these deaths and why it just seemed to start when he came to town. Since this is one of those movies where the old guy investigating some supernatural problem is accompanied by his youngish female relative for no good reason (see also The Blood Beast Terror for example) she immediately gets herself mixed up in things, thus providing us with someone in jeopardy that our heroes can rush to save as the film draws to a close. If you’re looking for zombies, you have definitely come to the wrong place. First of all, these are voodoo zombies, not George Romero zombies. This means that they’re easily kept in line by a gang of whip-wielding supervisors and though they can apparently kill you if they are told to, they aren’t about to go running amok and taking bites out of your face. They don’t actually do a whole lot, but that’s okay because you don’t get to see them much. Most of the action is centered around Sir James trying to figure all this business out. He has to do it all himself because the other two main nominal protagonists, Dr. Peter and Sylvia don’t do anything but stand around agog at everything transpiring or get themselves into danger. Likewise, the villain is a uninteresting cipher. 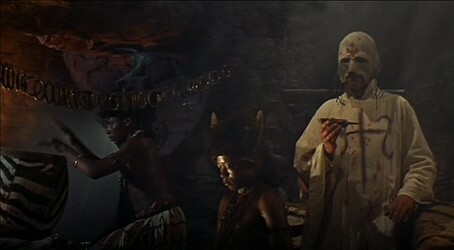 All we know about Clive Hamilton is that he knows how to do voodoo and uses zombies in the mine. Why? What’s he going to get by using zombies in the mine? If it was about power and money, couldn’t he raise the dead to do something, I don’t know, a little more ambitious perhaps? Too much old guy, not enough zombies, and a villainous scheme that no one even considered explaining. Just like Sir James did to Alice when she turned into zombie, this one needs a good whacking across the head with a shovel.